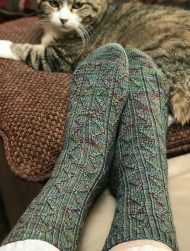 I designed these socks while knitting from sunup to sundown as a fundraiser for Alzheimer’s awareness and research. During the 16 hours of sunlight on June 19, 2018, I completed one and half socks. These socks are worked from the top down in columns of traveling stitches that resemble vertical lines of lightening bolts, Harry Potter fashion. The socks begin with a Twisted German (also called Old Norwegian) cast-on, followed by a few rounds of twisted rib. The remainder of the leg and instep are worked in the embossed lightening bolt pattern for an interesting but not-too-difficult knit. A traditional round heel (composed of a heel flap and gusset) provides a comfortable fit. The toe is finished with Kitchener stitch.